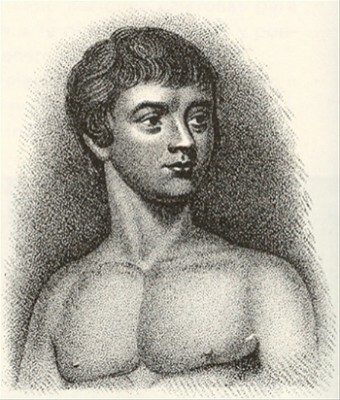 Victor of Aveyron was a feral child who was believed to have spent most of his childhood surviving alone in the woods. Captured twice in 1798 and 1799, he finally stepped out from the woods on January 8, 1800 on his own, perhaps hoping to escape a harsh winter and remembering the kindness he’d experienced from humans in the past. The villagers estimated the wild child’s age to be around twelve. Most agreed the boy had been living in the woods for much of his life, given his lack of ability to speak, odd food choices and scar-covered body. Although it was obvious that Victor was not deaf, he was examined at the National Institute for the Deaf in Paris to back up the Age of Enlightenment theory purporting one of the most important distinguishing factors between man and animal was the ability to use language. The renowned Roch-Ambroise Cucurron Sicard worked with Victor, but little progress was made. At this point, a medical student named Jean Marc Gaspard Itard took over the care of Victor. Itard believed two factors distinguished human beings from animals: empathy and language. His goal was to teach Victor to speak and also to communicate emotion. That said, Victor did make strides in his interactions with other people and was able to read body language quite well, among other similar things. Further, when the Itard family housekeeper was outwardly grieving the loss of her husband, Victor pulled himself away from his own activity and consoled the unhappy woman. So how did Victor end up abandoned in the wild? The leading theory is that young Victor may have begun to manifest a serious psychological disorder or other mental handicap that led to his abandonment, such as psychosis or schizophrenia. French surgeon Serge Aroles points out that Victor exhibited tell-tale signs of “mental derangement” such as repeated rocking, teeth grinding and spasmodic movement. Whatever the case, Victor spent the next 28 years of his life being studied and died in Paris in 1828.